Oceanfront, W. Yarmouth, Nantucket Sound & Lewis Bay. Warm water beach. 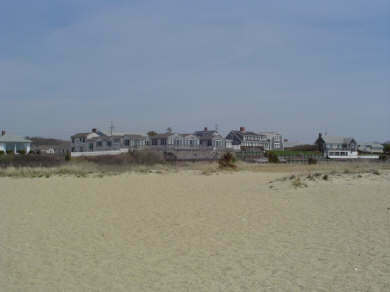 First Encounter is one of 10 Nantucket style beach cottage condominiums at Beach Bank. New construction from foundation to roof in 2002-03. First Encounter is a free standing cottage with 2 generous bedrooms and a great room. 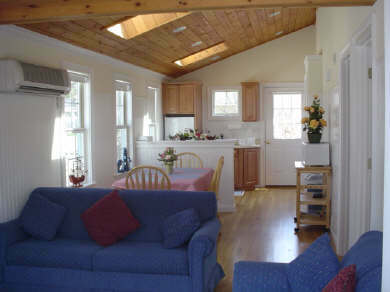 All rooms have pine plank cathedral ceilings with recessed lighting, great room skylights, oak hardwood floors, and tiled bath. 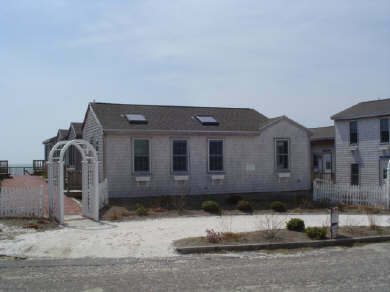 Rose arbors and antique brick pathways meander to the warm ocean water. 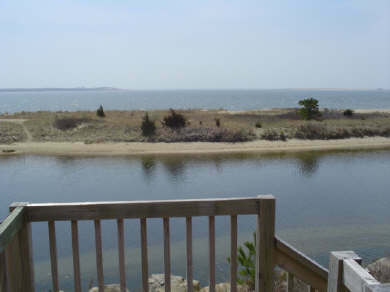 A common deck for grilling and sunbathing while watching the activity of Lewis Bay and Hyannis Harbor. Everything is fresh and sparkling, including a full kitchen. Swimming at your doorstep, one of the warmest beaches on the Cape. No loading up, driving, or searching for parking. Enjoy outstanding ocean views and sunsets as ferries to the Islands go by. Inquire by E-_MAIL,if you are seriously interested in a detailed description, we prefer you call at, 508-360-2405 or 508-398-3303. Additional pricing info: To reserve, half down refundable deposit at reservation time. Full amount required 45 days prior. State and local taxes of 14.45% will apply.